I have little doubt that there are many who will take offense at the image above, but let’s be honest, it isn’t the Lord who is truth incarnate that is being offended; rather, it’s the sentimental feelings of mere men. The three statements above are of the sort that the advocatus diaboli (“Devil’s advocate”) might make in the course of a canonization process; that is, up until 1983 when John Paul II abolished the post. If anyone wishes to play the role of the advocatus Dei; (Promoter of the Cause, literally, “God’s advocate”) to refute them, please, have at it. 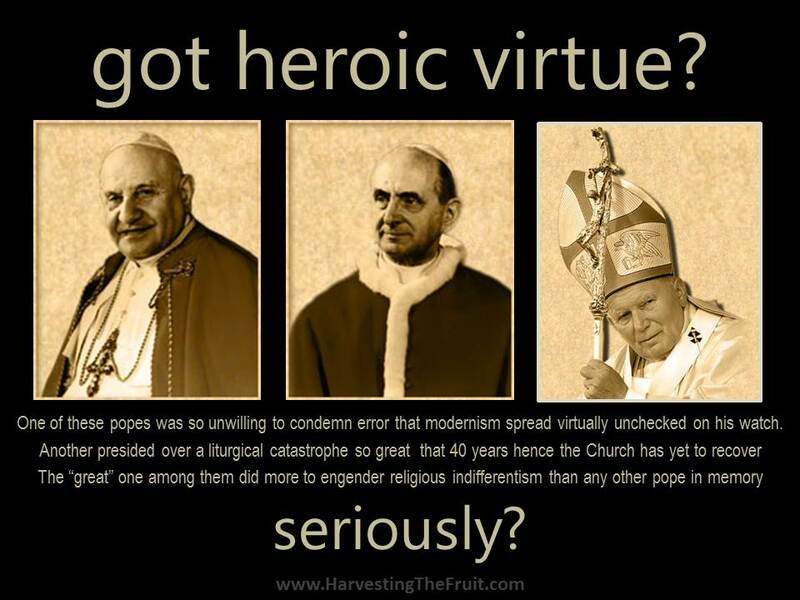 I´ve come to the conclusion that “heroic virtue” has been redefined and/or doesn´t matter anymore. What nowadays “really counts” is the “sense of the faithful” and “the people of God” “proclamining his (John Paul´s) holiness”. “A further sign is the number of biographies published about him and the number of his writings that are translated and re-published”. Don Luigi Villa´s research about all three popes (online for free avaiblable) helped me to understand what´s really going on. Thank you Martina. I agree that everyone should get on to the Chiesa Viva site and read as much as possible about Don Luigi’s life and work. To canonize such “heroes” as these three people is an act of diabolical insult to Christ the King and to Holy Mother Church. How can people truly be offended by truth? I’ve never quite gotten how they do. Don’t get me wrong, sedevacantism is basically protestantism, but c’mon folks the sentiment expressed on that is dead on. If there is some big secret or method the modern way of handling issues regarding faith and the Church, I and many others would sure like to know what it is. It seems that all of us lay folks are just supposed to assume that whoever is on watch has the best intentions and is making the right decisions based on whatever is happening in the world at the time, and it seems that it is all some big secret that no one needs to be concerned with. God forgive me if am in the wrong for writing this, but it seems to me like the modern Church speaks with two tounges way too often. Is God hiding himself within the Church to bring out true faith? Is He allowing all of this to seperate the wheat from the chaff? James, God will surely forgive your very real concerns. From the birth of the Faith founded by Jesus man has relied on the leadership of the Church and have followed that leadership as faithful sheep. We ALL know what is expected of us …. that we love and honor God and love our neighbors as we love ourselves. Every time man decides he is as good as God so therefore pushes God to one side and breaks all the rules — God chastises man by removing g GOOD leadership and replacing it with the dross who lead people to Hell. 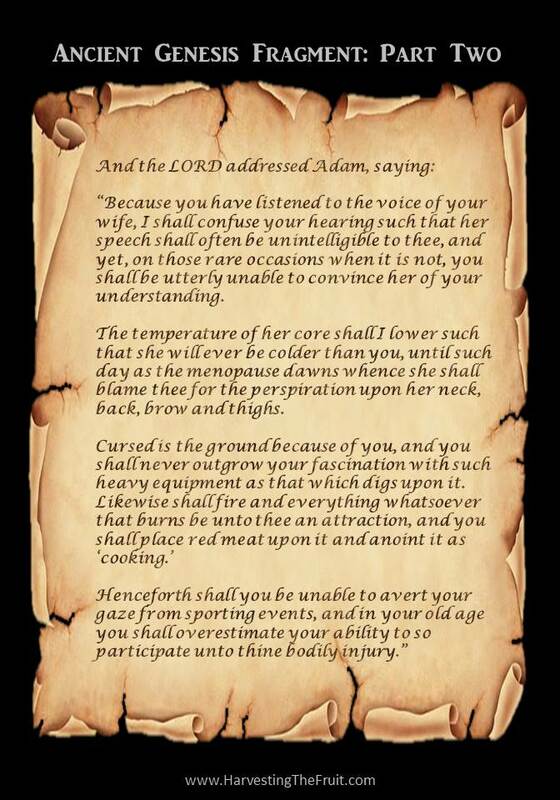 That is man’s punishment for denying God and throwing His love back in His holy face. The only hope for people who still love God and wish for Him and His love alone is to stay faithful to what WE know is the true faith. Cling to Our Blessed Lady and the Holy Spirit; say the Rosary daily [ or often] ; wear the miraculous medal and brown scapula; receive the Sacraments regularly and PRAY and make sacrifices for sinners. God bless you and keep you my friend. There is a method that applies to all ages: conformity to the magisterium and to the vicar of Christ. Using St. Pius X’s “Pascendi”(refuting Modernism) as a case for the reversal of John XXIII and JPII’s canonization is unfounded and never intended by Pius himself. He makes very clear that only those laymen and clerics who are ungrounded in philosophy and theology are to be ostracized. To accuse popes of such things, is ‘protestant’ and offensive. There is no sedevacantism from the Avignon popes, which had the most evidence for it, why should these men be accused? Thank heavens that St. Athanasius the Great did not subscribe to your version of “conformity to the magesterium and the Vicar of Christ”! How would we think of the Blessed Trinity today? As Arian heretics? What do we do when the magesterium and the Vicar of Christ are NOT in conformity with Holy Mother Church? What then? Blind obedience, i.e. obedience to error? And I’m pretty sure Pope Saint Pius X would have NO PROBLEM with his Pascendi being utilized to defeat Modernism; was that not the intent of the great encyclical? Prisca Ann – Bravo! I firmly believe that sometimes the Holy Spirit influences others by using us. Thank you.